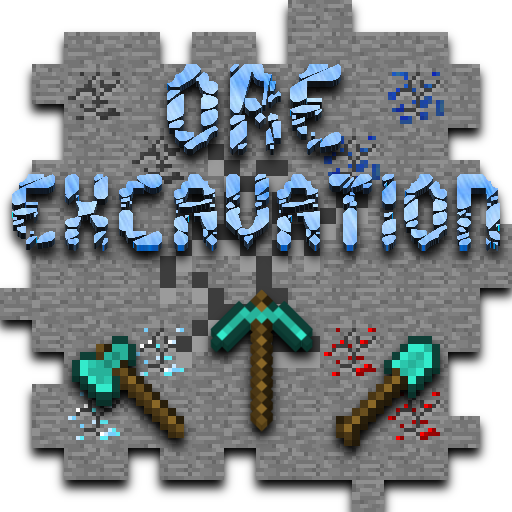 Allows players to mine whole veins of ore, cut down whole trees or any other tool based action in one go. Simple, easy to understand, configs are also provided for mod pack developers such as tool or block black listings, size limits, tick rate and much more. - Because of some outdated input libraries in Minecraft the excavation key may not work correctly on non-US based keyboards. Try refraining from binding symbols or special characters to this key. Can you add option to set the hunger take by block excavated please?? Also, if you can add possibility to make the leave Drop faster when you Excavate a tree, that will be great!! I want, if possible, to have something simillar for the wood, to "Tree Capitator" with your awesome mod :P.
The hunger config option already exists, it's called Exhaustion. Currently you can only modify harvesting cost per tool, not per material (there's a lot of ambiguity there I can't easily control). The closest you could get to what you want is making ever axe-like tool cost more to use. How I can configure options for one tool ou type of tool only?? There's an overrides JSON file in the config directory. You'll find wooden tools as example entries there. when you "veinmine" wheat u get a fatal error and kick me from server or crash the savegame. no crash report and nothing. Can we have a list with block names to add into blacklist? Cuz If I type "leaves" it's just nothing and I dunno how to properly manage it like I need to destroy jungle leaves but not other types Help with that pls. Or can we write ids like 5:3 to ban some blocks? The mod is not responsible for this. 1. I'm not really sure what you mean by this one but it sounds like a 'lazy' excavate trigger where if the tool matches then it skips the hot key check. Either way this doesn't sound like a critical feature and probably wouldn't work too well for non-standard tools from other mods. 2&3. This can't be done with the current system as I would have to pre-scan the blocks in range then sort by distance before even beginning to excavate. This would take significantly more processing time not to mention would cause issues if the blocks changed mid harvest. It says In game configuration, i just don't see any way of doing that. Am i missing something? Also seem to be having issues with actually getting it to work in general. Will there be documentation to go along with this mod for those like me having issues with it out of the box? In-game configuration is the same place many mods do this: Hit escape, click mod options, and find the mod in the list. Would it be possible to add a block whitelist so only certain blocks can be excavated instead of every block being able to be excavated. Because its really odd to me that you can excavate on things that aren't ores, trees, or leaves. If its not possible todo a whitelist, for the blacklist could you add Ore Dictionary compatibility so I can just put in ore:plankWood instead of listing every wood plank. Thanks for the suggestion. I've just posted a build that allows you to invert the blacklist to function as a whitelist for either tools and blocks. I also added ore dictionary support for you (you won't need the "ore:" prefix though). Is this mod client side only or does it need to be on the server too? You say this is an alternative to VeinMiner. In what way is it better/different? This version needs to be on server and client. This is because the server queries the client about their excavation control setup. It also means I only need to send start/stop messages to the server instead of one for every break request. This version is meant to be a little more efficient and user friendly to configure, especially for pack developers. It was also requested to be made. Feel free to use one or the other. Thanks for the quick response. Last question: by efficient, do you mean light weight (processing power), the code, or the hunger cost from mining? Lightweight in terms of processing power (although you could configure it to be TPS intensive).